Just like I did with Thor a few months back, I went into Captain America: The First Avenger without knowing much at all. Okay, so I saw the trailer a few times (as it was always attached to most of the movies I have seen at the cinemas this year), I knew that it was a part of The Avengers, and I also knew that it starred Chris Evans, who was my favourite evil ex in Scott Pilgrim vs. the World. Other than that, I didn't really know much about the character or anything. In fact, the only reason I went to see this is because it was an excuse to get out of Dannevirke these school holidays, and since I saw Thor in cinemas as well I thought 'why not?' The good thing is, this wasn't a shabby visit to the movies, that's for sure. This must be the greatest story for those who are bullied. Our main character, Steve Rogers (Evans) is a bit smaller than the average male, and because of all his health problems and minuscule stature, no one wants to let him enlist in the army to kill some Nazis. Poor Steve is always beaten up and such, but he always fights back because he believes he has to fight for his right, which usually gets him trouble. He meets Dr. Erskine (Stanley Tucci), who miraculously lets him finally enlist in the army, and now Steve is well on the road to becoming a soldier. But you know what would make this weak boy even better? Dr. Erskine has a serum that will make him taller, faster and stronger...basically a super human. Now he's Captain America, and has the mission of trying to take down evil Nazi research department HYDRA, which just so happens to be run by Johann Schmidt, better known as Red Skull (Hugo Weaving). Oh, and let's not forget that this is a superhero movie, therefore there has to be a love interest, who comes in the form of Agent Carter (Hayley Atwell). Now when I went to see Captain America, or any other movie of it's kind (in the cinema), I usually just try and have a good time. I really liked the film, but I do have to admit that it was nothing special. First of all, I felt like this movie could have been a lot more badass. As I said, I don't really know that much about the character Captain America, but I felt like he could have been a better brand of badassery. In saying that, he was a genuinely nice character, never wasting his new found powers and always knowing the meaning of fighting back. He makes for an interesting superhero, with his ultra fast healing times and whatnot. But the problem is the fact that he is invincible. He can't even get drunk. He's so bloody nice it hurts. Where Thor and Tony Stark have their arrogance, Steve Rogers has his niceness. The only thing that could count as a flaw is the fact that he is a little on the weak side, but that pretty much disappears once he undergoes that big transformation. The big transformation not only ends the flaws of Steve, but it also ends Stanley Tucci. Which really pissed me off. How dare he leave so early? Anyway, aside from Captain America's perfection, I still found the character's actions pretty interesting. Especially because of the way he was used as propaganda for the US army. The 'Star-Spangled Man' sequence was a particular highlight of the film, mainly because it was done the old-fashioned way. This film really excels with it's 1940's setting. Like X-Men: First Class, this film dedicates itself to the time period it is supposed to be in, incorporating history into it. The way it is made is very old-fashioned, as if it were made in the 1940's, just with better technology. Even with that better technology, director Joe Johnston opts not to overload the film with CGI, which is a huge relief. The villainous Red Skull looks believable rather than over powered by computer graphics. The fight scenes all manage to look very realistic, instead of trying ever so hard to look good for the 3D audiences. But the best thing that the CGI does, which you actually can't even tell is CGI really, is the appearance of Chris Evans before he becomes a beast. We all know that he doesn't actually look as small as that, but the effects used will have you believe that he did once. Performance wise, this film is very strong. Evans did a brilliant job in his role, I thought, even though there was definitely room for improvement in the character. Another thing I didn't like was the relationship between his character and Agent Carter. It was all very nice, but they didn't seem right for each other at all. In saying that, Hayley Atwell, one of the brightest young talents around, was really good in her no-nonsense role. Tommy Lee Jones is a hero of deadpan humour in this flick, definitely getting the most laughs. Sebastian Stan, who seems to be in everything I watch these days, makes for a nice, if a little dull sidekick. One person I could have done with more of, though, was Dominic Cooper as Tony Stark's daddy, Howard. Once I got over the fact that he could actually speak in a good American accent, I kept wanting to see his cocky character show up...which didn't happen an awful lot. But usually the star of the show in a superhero flick is usually the villain, and when the villain is played by Hugo Weaving, it's a double win. He's kinda scary with his Hitler-esque dreams and appearance. One thing I did have to laugh at was the whole "Heil HYDRA!" business. That was so silly it was funny. A lot of people have compared this to Thor, mainly because they're the last installments in the longest trailer ever for The Avengers. I think I enjoyed Captain America a little more, but I do have to admit this was quite simple compared to Thor. There wasn't any father/son conflict, nor was the main character put through a significant emotional change. But people probably should stop comparing the two. They both stand up well as their own films, especially considering that they are just small features before the big presentation. I do have to say that now Captain America has come along and it was a damn good film, my expectations for The Avengers have sky-rocketed. THE VERDICT: Captain America: The First Avenger has style and class in it's setting, an adequate use of CGI and some solid performances. 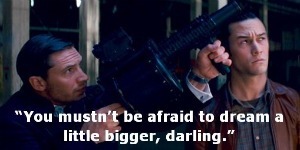 Yes, you better be ready for The Avengers. Nice to see you liked it Stevee. A little more than I that is for sure. I thought it was fair to middling at best. Even though the 3D screening was on at a more appropriate time, I chose good old 2D! I'll remain forever faithful to my dear two dimensional screenings. Agreed as I skipped the 3-D as I consider it over rated. Good write up and you got to the heart of it. Flawed yes, but we expected that didn't we?! It's still alot of fun though. I'm surprised at how much I enjoyed it, and was just relieved not to have a potential dud to come home and write about! I saw African Cats the day before. It was beautifully filmed but the script and narrartion was a real let down being too kiddie orientated. Stupid considering it is a fund raiser film for African conservation groups. Interesting review Stevee. He's one character that aside from the costume, I know nothing about either. But I'm a bit wary of all superhero films these days so I'll probably wait for the blu-ray. I really liked it. It's surprising that I, of all people, ended up rooting for the really really good guy. I mean Hugo Weaving was brilliance, but Captain America was such a darling. And I thought Atwell was excellent. More than anything I think, I was really impressed by the look of the film. Thor didn't really excite me quite like this. Also, I liked how the film focused on just one person mostly, rather than what happened in X-Men, which would have been much better if there were fewer characters. 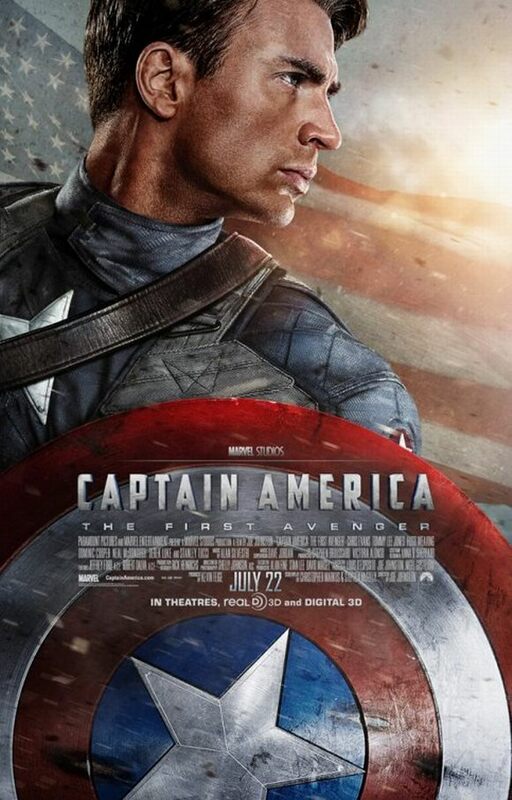 SO basically what I'm saying is that I think Captain America my pic for The Superhero Movie this year. Hugely enjoyable and superbly written, this is a thrilling action-adventure that gets just about everything right, especially the casting of Evans as Captain America. Good Review! Brent - I avoid 3D as much as I can. I don't like it at all. And I was glad this didn't turn out to be a dud too! A good, fun film. Bonjour Tristesse - Yeah, if you're not into superhero movies, I wouldn't suggest rushing to the cinemas to see it. But do get around to it! Nikhat - Cap was a darling. And Atwell was excellent! She's gorgeous! I think X-Men is still my pick for superhero movie of the year, but I do agree, it could have done with less characters. I liked how simple this one was, though! Dan - The casting of Evans as Cap was the best thing it did!